The crisis engulfing the European economy is beginning to manifest itself it in unexpected ways, not least the growing demands for independence in the regions of Southern Europe. Last week it was Catalonia. This week Venice. Where is it going to end? On Saturday, several thousand Venetian separatists took gondolas (what else?) across the Grand Canal to demand the recreation of an independent Venetian state with its own language and Government. 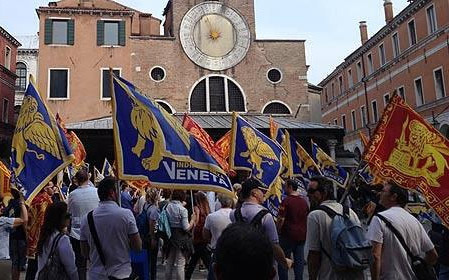 Recent polls suggest that between 70 and 80% of Venetians back independence from Italy, in a region that proudly ruled itself for centuries until it was crushed by Napoleon in 1797. They had another brief flirtation with self-rule after the revolutions of 1848, before voting in a referendum in 1866 to join the newly created state has become modern-day Italy. Might it really happen? Rome will, of course, resist vehemently, but in the current climate Venetian self-rule may be no less likely that independence for Catalonia or Scotland. And as in Catalonia, much of it is being driven by a perception that they have been paying too much for too long to the central Government. Venice (the region rather than the city) is, like Catalonia, a huge net contributor to the national Treasury. That was just about acceptable in the good times. In the midst of austerity, it is becoming a powerful source of resentment.